The Denison Burial Ground was established by the Denison family in 1698. This hallowed ground is the final resting place to over one hundred Denison family members. The burial ground is presently owned and maintained by The Denison Society. The Burial Ground is located on Route 1 in Mystic. It is believed in 1907 this civil war Parrot Cannon was placed at the Denison Burial Ground by the GAR. 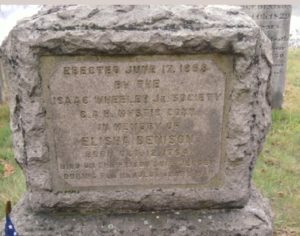 Here lies Elisha Denison who died on the Prison Ship Jersey during the Revolutionary War. This is the resting place of George Denison , grandson of Captain George and Ann. George, along with his bride Lucy Gallup Denison, built the present day Pequotsepos Manor in 1717, after the original home was burned down on the eve of their wedding.